1E. D. Manley (e-mail: eric.manley@drake.edu) is with the Department of Mathematics and Computer Science, Drake University, Des Moines, Iowa 50311, USA. 2J. S. Deogun and L. Xu are with the Department of Computer Science and Engineering, University of Nebraska at Lincoln, Lincoln, Nebraska 68588-0115, USA. 3D. R. Alexander is with the Department of Electrical Engineering, University of Nebraska at Lincoln, Lincoln, Nebraska 68588-05111, USA. 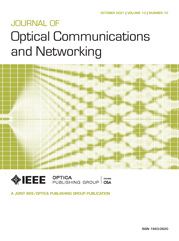 We investigate the application of network coding to all-optical networks from both the algorithmic and infrastructural perspectives. We study the effectiveness of using network coding for optical-layer dedicated protection of multicast traffic that provides robustness against link failures in the network. We present a heuristic for solving this problem and compare it with both inefficient optimal methods and non-network-coding approaches. Our experiments show that our heuristic provides near-optimal performance while significantly outperforming existing approaches for dedicated multicast protection. We also propose architectures for specialized all-optical circuits capable of performing the processing required for network coding and show how these devices can be effectively deployed in an all-optical multicast network. 1: Initialize subgraph H ⇐ ( V , ∅ ) . 2: Create an initially empty | T | × ( κ + 1 ) path matrix p such that p v , i will store the ith edge disjoint path from s to v.
4: Set T 0 ⇐ T .
6: Initialize node v best ⇐ null . 7: Initialize path p best ⇐ null . 8: Initialize cost c best ⇐ ∞ . 18: Set the weight of e in G 0 to 0. 20: Find p v , i , the shortest s − v path in G 0 . 27: Set H ⇐ H ∪ p best . 28: Set T 0 ⇐ T 0 − v best . a We assume that the β outputs from the coding units need not be switched to the inputs of the coding units. a “Converters” refers to serial-to-parallel and parallel-to-serial converters, each of which have nontrivial cost and complexity in terms of m.